Bring your used pumpkins to our 2nd annual smashing event on November 3, 2018. It may have been the Bible Study leaders bringing their concern for the environment with them to church who started us. That was over 30 years ago. In more recent years a small group ministry start became today’s Green Disciples, leaders in environmental care around the church. Now we are known for our recycling training events at Bloomingfest in West Chicago and for collecting unusual items. See our list below and where they go. We’d love to receive any donations, because we believe in keeping these things out of the landfill. for the Shoeman Water Project. Find our collection bins outside the church. We have sent over 28,000 pairs to Mr. Shoeman for reuse. The money he collects from small business people for the shoes is used to dig wells in Africa and Haiti. for the Ronald McDonald House. Bring them inside and find jars at either entrance to receive the tabs. Ronald McDonald House has collected them for years. We now give them to the Winfield site, but our numbers are currently low due to switching locations. Help us get on the wall this year by keeping your pop can tabs for us. for SCARCE. The plastic bread closures are a different kind of plastic which recyclers do not want from the community one bin recycling. A child in another state decided to make a deal with her local recycler to collect enough tabs to make it worth while to switch machine settings for occasional runs. What does she get out of the project? Money for wheelchairs for young people. We are the designated West Chicago location for SCARCE to collect old holiday lights. The bin appears in November outside the church’s west entrance. It will stay up through Jan 6. 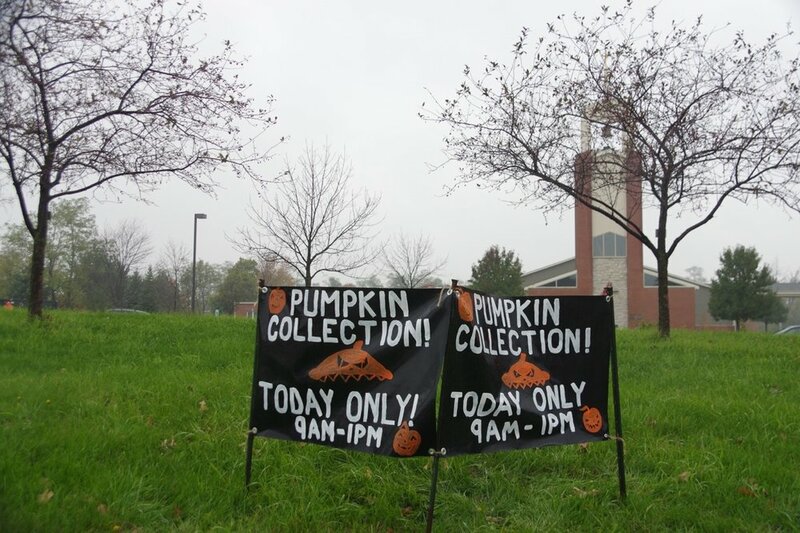 One of our newest projects is to host a pumpkins collection on the first Saturday of November. This coincides with our Holiday Bazaar, a indoor lunch and craft sale held ever year by our United Methodist and Congregational Women. Pumpkins get tossed into a composting garbage trailer. Toss it yourself, or get some help from our volunteers. A project for all United Methodists is to keep foam containers and packaging out of the landfill. We have an all church policy to not use polystyrene for any of event hosted at our church. We go the extra mile by collecting small amounts from friends who need a place to drop off their Styrofoam. Please find a container in the kitchen of the church. Some of our recycling advocates will take an occasional load to Dart in Aurora where outdoor bins stand ready to receive 24/7. We’re collecting these again as of April 2019. We found a source to take orange pill bottles to Doctors Without Boarders. Please remove labels and clean them up from medicine residue. The collection box is at the East Entrance.